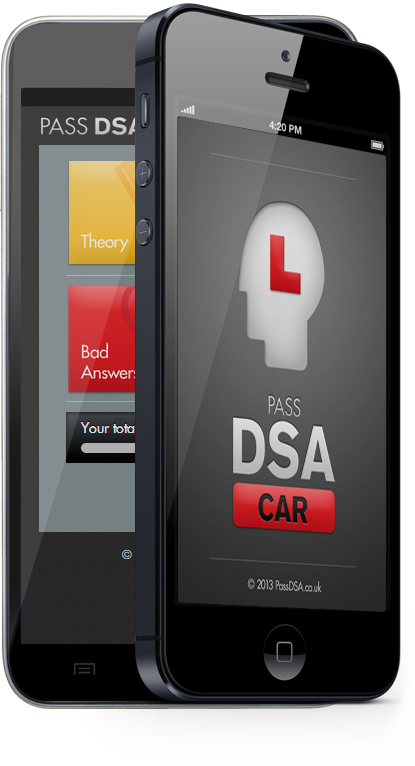 Application will help to prepare for the DVSA driving test much faster. 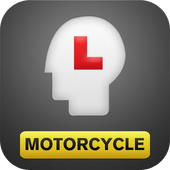 No matter what is the test - car, lorry & bus or motorcycle, we’ve tailored an ultimate application to get you nail the test with a maximum score. 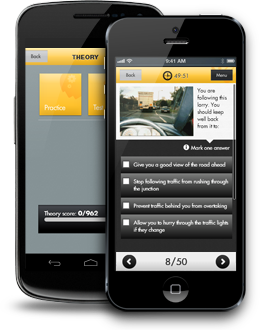 Select any of the topics in the theory test and start practicing. Learning theory questions became easier than ever! After answering each question - correct answer is displayed and official DVSA Explanations are given. Prepare yourself to score maximum. 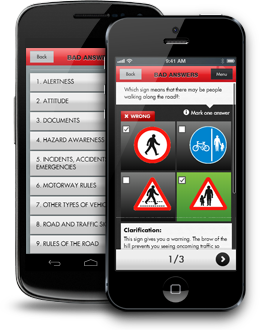 Full application versions are loaded with official questions: car version contains over 900 theory questions, lorry & buss - over 1200, motorcycle - over 800 questions divided into 14 topics. Lite versions contain over 150 theory questions. Get them all answered and remember -, practice makes perfect! The DVSA theory test consists of series of multiple-choice questions (some of which require more than one answer). 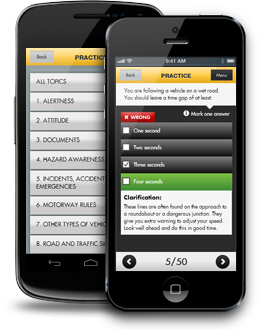 Prepare for the theory test with built-in mock tests. 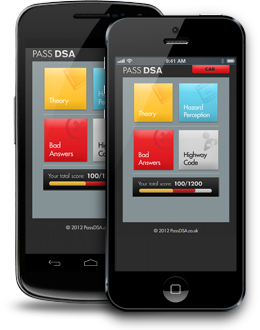 In all application versions, there’s a comprehensive bank of sample DVSA theory test questions. Start practicing and you will get an idea, what DVSA theory test questions are like and will see your preparedness for the test. All full versions contain 8 hazard perception videosperception videos. 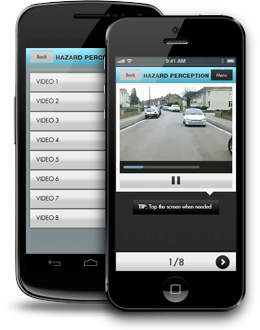 Each video plays hazard situations - something that will cause the driver to change speed, direction or stop. 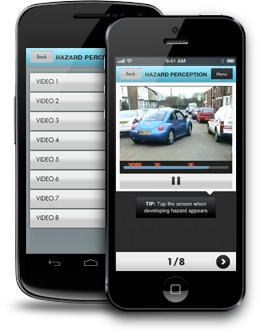 It’s easier than ever before to identify and control the hazard situations in the app as you may identify the correct hazard by just tapping on video at the right moment. Hazard perception test forms the second section of the theory test. The pass mark for this part of the test is 24 out of 40 (i.e. 8 hazards x 5) for car drivers and motorcycle riders. 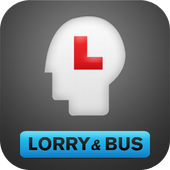 Those taking LGV or PCV (lorry or bus) tests must score at least 26 out of 40. Although each clip contains several potential hazards, only the one, that materializes into a real hazard (one clip will have two hazards) and involves other road users, is marked. This is known as the “developing hazard”. Therefore, you will only receive a score if you spot a hazard before it fully materializes and is brought about by the action of another road user. In a few instances it is difficult to determine when a potential hazard becomes a developing hazard and therefore when the scoring window should start. Each Hazard Perception scoring window is divided into five equal segments and a score of five through to one allocated to each. Those responding in the first segment of the scoring window will score 5 and those in last segment a score of 1. Responses outside the window will score zero. When mock test are completed, bad answers fall into separate are where they could be reviewed later. Review these bad answers to check where you need to work. App will not let you miss out any INCORRECTLY answered questions. 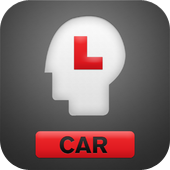 An essential reading if you want to learn to drive and pass the theory test is the theory. 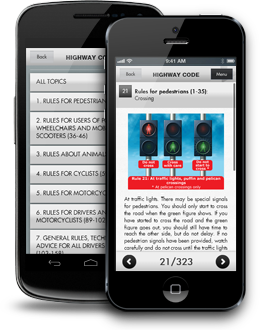 All versions contain full eBook of The Official Highway Code, structured in topics and pages for easy learning. Start studying instantly on the go. 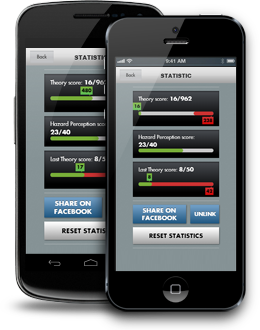 Statistical progress review diagram will let you prepare for the theory test faster. Progress bar will let you know: correct and bad answers and remaining number of questions haven’t answered yet. Once you have learned to answer the questions from all the topics, proceed to completing the Mock test.